Bamberg, 31.01.1919, Gründeraktie über 1.000 Mark, später auf 1.300 RM und 1.000 DM umgestempelt, #37, 34,3 x 23,8 cm, braun, ocker, schwarz, DB, leichte Knickfalte quer, sonst EF, Lieferbarkeitsbescheinigung rückseitig angeklebt, Auflage nur 1.000 Stück, sehr dekorativ mit zwei Flaggen und Schiffsvignette, R10! 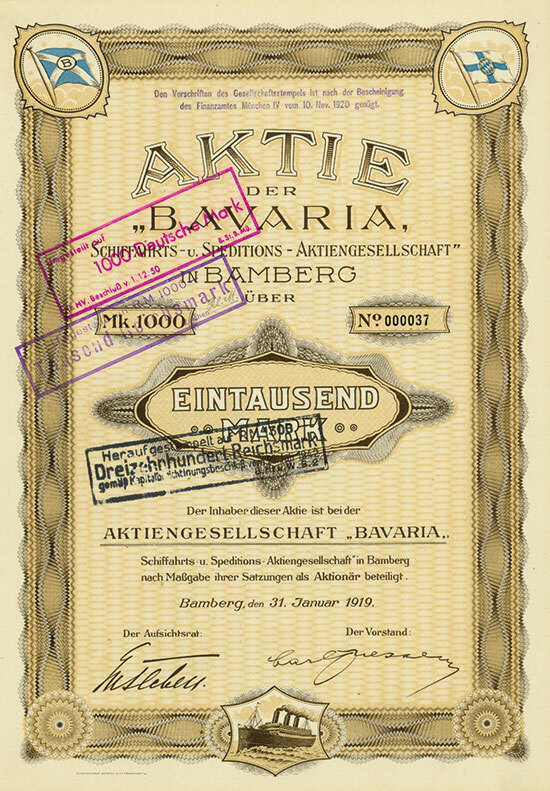 Bamberg, 31 January 1919, Founder’s Share of 1,000 Mark, changed by stamps to 1,300 RM and 1,000 DM later, #37, 34.3 x 23.8 cm, brown, ochre, black, 4 pages, minor horizontal fold, otherwise EF, „Lieferbarkeitsbescheinigung“ stuck on back, only 1,000 shares issued, superb with two flags and ship vignette, R10! The company was incorporated on 21 September 1918 and registered on 27 January 1919. It was active in the shipping, forwarding and carrier’s business as well as in the insurance and commission business. The company built and operated warehouses, loading and unloading plants, and did lombard business. The company held stakes in Bavaria Agentur Gesellschaft m. b. H., Bamberg, and in Bavaria Kohlenhandelsgesellschaft m. b. H., Nurnberg. It had a joint business and a community of interests with the Demerag Donau-Main-Rhein-Schiffahrts-A.-G., Nurnberg. Later, the main office was in Bamberg and the administration in Aschaffenburg. The company built a new administration building in Aschaffenburg in 1972.